Definitely not a shot taken from the SkyTrain. As part of the ongoing rehabilitation project, the Pattullo Bridge will be closed to vehicle traffic (the sidewalk will remain open for cyclists and pedestrians) overnight starting from 8 p.m. on Thursday, May 12 to 5 a.m. on Friday, May 13, weather dependent. We encourage drivers to plan alternate routes to cross the Fraser River during this overnight closure. Transit customers planning on crossing the Fraser River should plan on longer travel times on the N19 NightBus which will re-route via the Alex Fraser and Queensborough bridges. Drivers are reminded that when the bridge is open, the speed limit is 30 km/h. This ensures the safety of workers and all users of the bridge. The Pattullo Bridge is one of the oldest bridges in the region. Comprehensive deck rehabilitation work is needed to maintain road safety and bridge functionality. TransLink thanks everyone for their patience while we do this important work. We’re devoting a handful of posts over the next couple of weeks to the roads and bridges TransLink is responsible for in the region. For the basics on TransLink’s roads and bridges, check out the Managing major roads and bridges in Metro Vancouver post from our TransLink 101 series. July 20th marked the first full day closure of the Pattullo Bridge summer weekend maintenance work. TransLink took this opportunity to invite local media to tour the 76-year-old bridge for a “behind the scenes” look at the work being completed. As the organizer of the event, I decided to take a few notes myself and share them with our Buzzer readers. We then walked up the stairs onto the bridge deck to see construction workers at work. They were jack hammering the bridge, creating extremely loud drilling noises and causing lots of dust particles to fly all over our faces. I’m glad everyone was wearing their safety vests, hard hats and steel toed boots! Along the bridge you could see red rectangles marked throughout. Bob said those were identified as “delaminated areas, where horizontal cracks are formed in the concrete, allowing water to flow through and causing the rebar to expand and corrode.” In layman’s terms, the concrete cracks create potholes, the water gets in and the rebar (made of iron) rusts. Again Bob adds, “this is normal wear and tear for any aging bridge. This is why it’s important for us to address these issues, complete this maintenance work and ensure Pattullo will maintain in a state of good repair”. What’s interesting to note is how the delaminated areas are identified. As a standard test, a 10 feet long chain is dragged across the bridge. The sound created from the chain and concrete hitting determines the areas of delamination. High pitch tones means the area is delaminated and low pitch tones means the deck is still solid and intact. After identifying the delaminated areas, workers then mark the areas in red (explains the multiple red rectangles), break the concrete, clean the rebar and loose concrete, pour grout and repave the area. With over 77, 000 daily commuters traveling across the Pattullo Bridge, I’m glad to see the maintenance effort put forward to ensure this aging bridge is always in a state of good repair. This tour was both interesting and educational for this transit junkie. I hope you enjoyed reading about it as much as I enjoyed seeing it! Fallon concrete on the ground, sign of normal wear and tear of any bridge. The construction workers at work! Creating extremely loud drilling noises and causing lots of dust particles to fly all over. 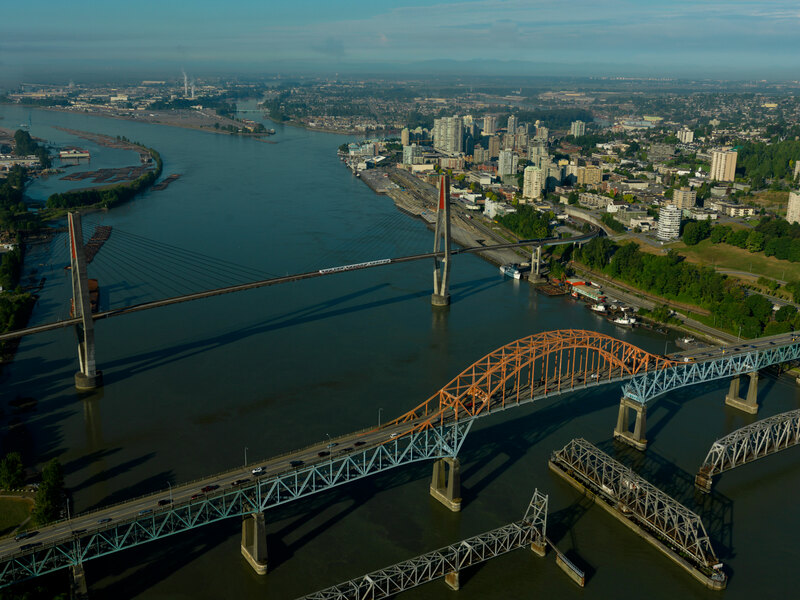 Due to maintenance and repairs, the Pattullo Bridge will be closed to all traffic (including bicycles and pedestrians) for three weekends this summer. The planned weekend closures start on Fridays at 9 p.m. and end on Mondays at 3 a.m. during the following weekends: July 19-22, August 9-12, and August 23-26. The weekend closures will run from Friday at 9 p.m. until Monday at 3 a.m. Motorists should plan alternate routes to cross the Fraser River and transit customers should plan for longer travel times on the N19 and #321 during those weekends. For more information, click here to see the press release or visit http://www.translink.ca/pattullo.